Electric food steamers have become one of the most essential items in the modern kitchen. Food steaming is possibly the most healthy cooking technique as it helps retain the essential nutrients that foods provide our bodies. The market is currently flooded with multiple brands and models, which makes the selection process quite overwhelming. However, the following review of the best electric food steamers will certainly help you make a wise choice. Hamilton Beach Digital Steamer perfectly fits the descriptions worry-free and versatile. The fact that it can help steam a variety of foods makes it very flexible and convenient. 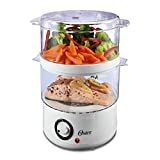 Be chicken breasts, eggs, vegetables, fish or other kinds of seafood, you certainly cannot go wrong with this steamer. It features two transparent bowls that allow you to steam two different types of foods all at once. All you need to do is just fill the reservoir with water and press the up/down keys to set the delay timer. The delay timer enables you to fill the steamer with food in advance and start steaming later. One good thing with this steamer is that it is digitally operated and pre-programmed. It automatically shuts off to warm when cooking is done so it needs less monitoring. Clean-up is definitely a breeze since the bowls, tray and a detachable collar is dishwasher safe. As the name suggests, Oster 5712 comes in a double-tier design consisting of two transparent steaming bowls that let you cook two different types of foods simultaneously. The steamer features a 6.1-quart capacity. It has large and small steaming bowls have a capacity of 3-4/5-quart and 2-2/7-quart respectively. For easy operation, the steamer incorporates a user-friendly interface featuring an LCD display. Oster 5712 is pre-programmed and digitally operated. It has a 95 minutes maximum cooking time with a delay timer of up to 12 hours. Once cooking is done, the steamer switches to warm. This keeps your food at the right temperature for up to one hour. This steamer is easy to clean and maintain. Black & Decker HS1050 has a 7-quart capacity. It comes along with a large and small steaming basket with a capacity of 4-quart and 3-quart respectively. Besides that, it incorporates a 5-cup rice bowl with a 12-egg nesting basket. This steamer has a water window for easy monitoring of the water level in the reservoir. An external water fill allows you to accurately fill up the reservoir without having to detach it from the steamer. The unit is programmed and features a 75-minute digital timer with a warning bell that alerts you when the food has finished cooking. T-fal VC1338 is a 4-quart capacity steamer with a 2-tier design. It features two steaming bowls with a capacity of 2-quart each. This offers you a perfect option of making 2 different dishes for a single meal. It allows you to steam a variety of foods including vegetables, meats and seafood. The tiers are detachable to allow for compact storage. The steamer features digital controls with a pre-programmed 60-minute countdown timer. It requires less monitoring and you can perform other tasks while it cooks the food for you. Secura 3-Tier 6-Quart food steamer comes in an attractive exterior finish that provides a nice addition to any kitchen counter. It features a 3-tier 6-quart detachable steam basket that enables multiple foods to be cooked simultaneously. The best thing about the steaming baskets is that they do not compromise the flavour of your food and cook within 30 minutes. Besides cooking, these baskets can also be used for serving purposes. The reservoir is filled with hot or cold tap water which is quickly heated to generate steam in just under 15 seconds. In case you forget and the water level gets too low, the unit shuts off automatically. The unit is a dishwasher for easy cleaning. This is a highly versatile unit that has been rated the best in the rice cooker category. It functions as both a rice cooker and a food steamer. It features a 20-cup capacity with an ability to prepare 4-20 cups of rice. Not only does it cook rice, but also steams a variety of foods, such as meats and vegetables. It has a programmable slow cooking function of up to 10 hours to provide maximum flavour to your food. 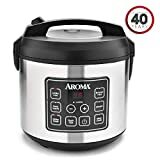 The Aroma 20-Cup food steamer incorporates a programmable digital timer that features a 15-hour delay function. With this unit, you do not need to worry regarding overcooked food as the time can be initially set after which the steamer automatically turns to warm settings. It has a non-stick pot that removes for quick and easy cleaning. Viante CUC-30ST food steamer incorporates an elegant design that will certainly give your kitchen counter that classy look. It features a unique design that comprises of three separate compartments each having its own timer and temperature controls. It incorporates a digitized control that is programmed to automatically set the start time for each compartment. This ensures that all foods finish cooking at the same time. The visible water gauge allows for effective monitoring of the water level in the reservoir. The unit is dishwasher safe for easy cleaning and maintenance. Hamilton Beach 37537 is a digitized electric food steamer that incorporates a 2-tier construction. It consists of two steaming bowls that are transparent for effective monitoring. You can cook two different foods in each bowl or you can remove the divider between them to form a single bowl for steaming large quantities of foods. It incorporates programmed settings with a delay function that allows you to fill the steamer with food and commence steaming at a later time. 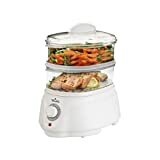 This electric food steamer is ideal for steaming vegetables, raw fish, seafood, rice, meat and poultry. Rival CKRVSTLM21 is a 4.8-quart food steamer incorporating a double-tier design with two transparent bowls. This enables you to cook more than one food at once. It features an instant steam function that allows you to cook faster and effectively. The unit is programmed and features a 60-minute timer. The bowls are designed to perfectly nest for compact storage. Oster CKSTSTMD5-W is a highly advanced electric food steamer. It has a 5-quart capacity with two steaming bowls. These bowls are transparent so that you can watch the food being cooked. It has an automatic 60-minute timer. The unit is designed to shut off automatically when cooking is complete or when the water level is very low. It is dishwasher safe and can be easily washed and wiped clean.